Whether your old bathtub looks dingy or you're just tired of how it looks, you can change its color with paint. Before purchasing bathtub paint, however, confirm what kind of tub you have. Some old tubs may be cast iron or porcelain, while newer tubs may be fiberglass, ceramic or acrylic or have an enamel finish. Certain paints adhere better to certain surfaces, so look for a paint designed for your tub's surface or use a multi-surface paint. Change your tub's color with paint. Clean all dirt, soap scum and limescale from the tub, using a powdered cleanser. Use a commercial limescale remover if necessary. Sand the entire surface of the tub until it is no longer shiny. The roughened surface will make paint adhere better. Rinse away the dust and wipe down the tub with a microfiber cloth. Allow the tub to dry completely. 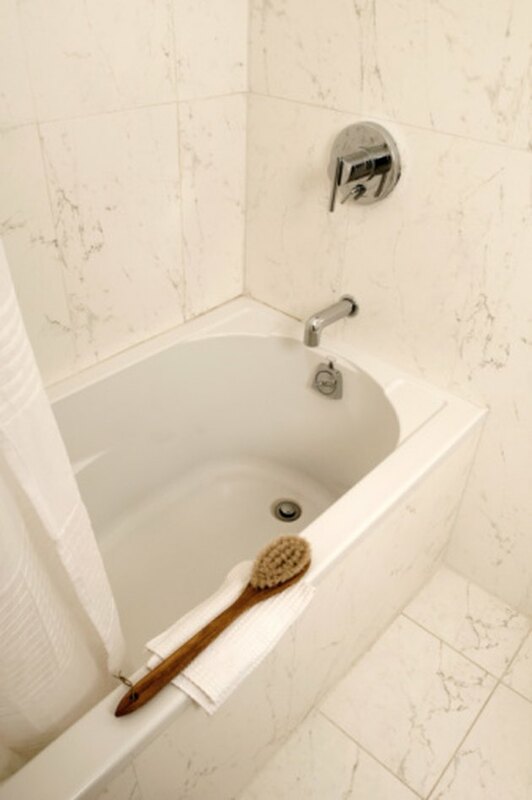 Apply painter's tape around the edges of the bathtub and to the fixtures, including the drain. Trim the edges of the painter's tape neatly with a utility knife. Add the hardener to the paint as directed on the hardener container. If the paint is designed for painting bathtubs, the hardener is likely to be included in the paint. Apply a base coat with a brush or roller, working quickly to avoid streaks. Cover the mixed paint and allow the coat to dry for one to two hours. Reopen the mixed paint and apply a second coat of paint to the entire surface, taking care not to leave streaks or drips in the surface. Clean up with an epoxy thinner. Remove the painter's tape slowly after an hour or two. Allow the tub to dry for at least 36 hours before using it. What Kind of Paint Can You Use on Bathtubs?